Try your hand at racing, shooting, collecting, hitting and jumping to get the top score! Arcade Games offers an exciting variety of classic to new age games for kids and adults alike. State-of-the-art machines are operated on a Playcard system, offering players a seamless gaming experience. Up for grabs are a host of prizes. 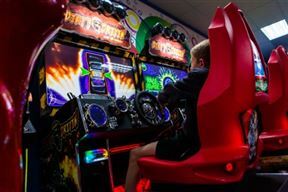 Arcade Games is 2.9km from the centre of Amanzimtoti , the nearest airport 52.5km (King Shaka International Airport).